Panola Mountain State Park was created in the early 1970’s to protect the delicate ecological features of this 100-acre granite monadnock. The mountain is similar to both Stone Mountain and Heritage Area sister, Arabia Mountain but unlike either, it has never been quarried. Today, the park has expanded to more than 1,600 acres and includes lakes, a former golf course now returned to nature and early settler homesteads. Hikers may explore the park’s watershed and granite outcrop on their own, or they may make reservations to join park rangers for guided hikes onto the restricted-access mountain. Panola Mountain is a designated a National Natural Landmark, and pets are not allowed on trails in the conservation area. However, the paved Rockdale River/Arabia Mountain PATH Trail is open to leashed dogs and bicycles. This rolling journey takes visitors past two fishing lakes, grassy fields, shaded woods and rock outcrops, over the South River and beyond. Deer, turkey and other wildlife are abundant. Those who ride this trail may join the park’s Muddy Spokes Club. 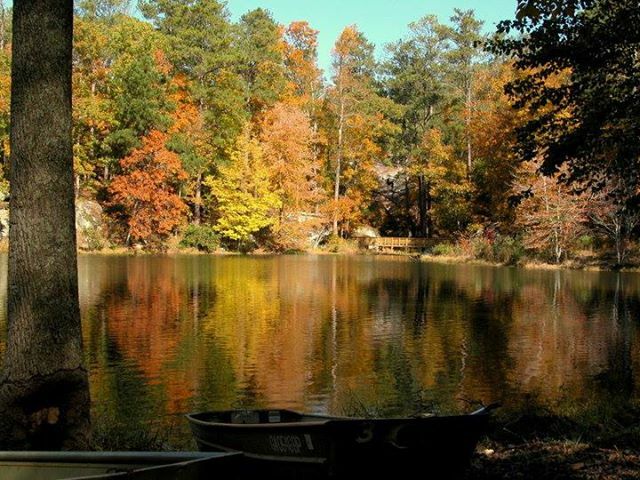 Fishing, archery, geocaching and tree climbing are available in addition to regular hikes. Picnic pavilions and playgrounds are near the nature center. There is a $5 parking fee or become a Friend of Georgia State Parks and receive an annual parking pass. Visit Panola Mountain’s website here for complete program information or check out our events page.